Teams of future entrepreneurs from The Citadel are making adjustments to their business plans and elevator pitches after attending Charleston’s fourth PitchBreakfast at the Harbor Entrepreneur Center. 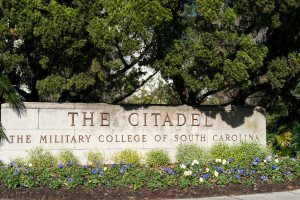 On February 15, The Citadel teams were the sole presenters at PitchBreakfast, an event that gives teams five minutes to pitch their business idea to an audience and panel of experts. After each pitch, the audience and panelists provide 10 minutes of feedback. 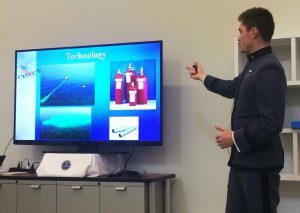 The five teams that presented are the finalists in the fourth annual Tommy and Victoria Baker School of Business Bulldog Business Bowl, a competition aimed at budding Citadel entrepreneurs who have an idea for a new product or service and the desire to turn that idea into a business. After listening to the five pitches and providing feedback, the audience and panelists selected Terch Products as the strongest pitch, with Integrated Solutions Technology as runner-up. 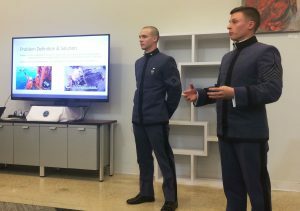 Though PitchBreakfast is for educational and practice purposes only, the event gave The Citadel teams an opportunity to receive expert advice before their presentations at the Bulldog Business Bowl finals, where a $10,000 grand prize and $5,000 second-place prize are up for grabs. Dustin Neumann, team member of Terch Products, said the feedback his team received at PitchBreakfast was extremely valuable. After teams were chosen for their business ideas in November, they advanced to the second round where they made an elevator pitch to a judging committee in December. In the final round, which will begin at 9 a.m. on Thursday, April 19 in Bond Hall, they must present a fully developed business plan that includes marketing, financial projections and pricing and production strategies. PitchBreakfast is an event that provides local founders, entrepreneurs and startups the opportunity to practice and receive feedback on one of their most important assets – their pitch – in a safe and supportive environment to help get them investor-ready. 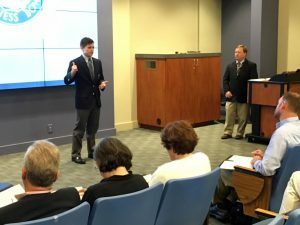 The event was founded in Charlotte, N.C., in 2013 and has since expanded to Charleston and Asheville, N.C.
Thursday’s PitchBreakfast in the Harbor Entrepreneur Center was the fourth installment of the Charleston event, and it was the first time they collaborated with The Citadel.